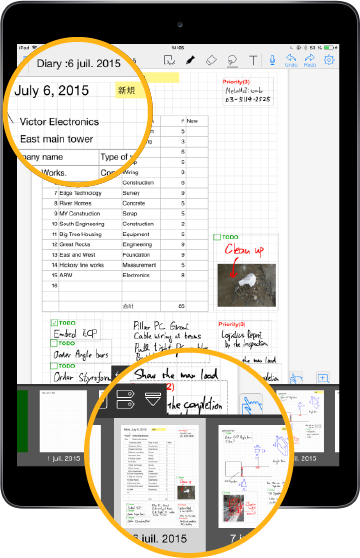 Yacho helps to capture structured form and freehand information for actioning, analysis, reporting and archival. Yacho is used across all areas of construction and civil engineering and by other industries involving field based activities. Inspired by the Gemba Kaizen concepts of continuously finding improvement where the work actually takes place, Yacho brings the key productivity functions found across multiple applications into a single mobile app. Yacho was created from our multi-award winning notes platform to cater for the day to day needs of workers on-site and in-office, with close input and feedback from one of Japan’s largest construction companies. Information comes in many forms and Yacho is designed to help you capture it quickly. 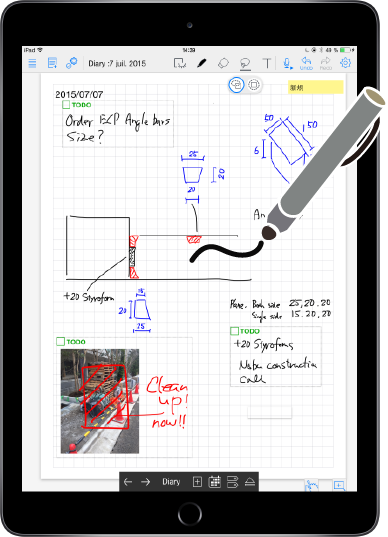 Yacho combines the flexibility of pen and paper with digital media capture directly from your tablet. Yacho is delivered with a selection of form templates and any form you have in PDF or office format can be imported to the system and used. 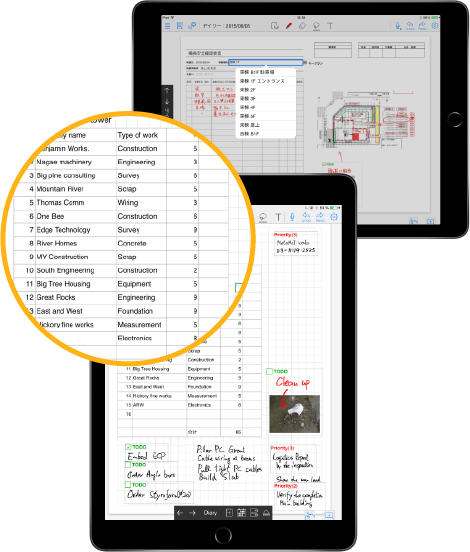 In addition you can add the built-in spreadsheet component to any page of your document to capture data and perform calculations. We deliver a number of pre-defined forms with Yacho but you are not restricted to using these. Simply import any existing forms from PDF or office documents and use them as templates within the app. Forms can be multi-page and it is easy to create a copy of any page layout if more space is needed. The built-in spreadsheet component can be used to capture data in a tabular manner and perform simple calculations. It is available to add and position wherever you want it, as many times as you need it. Yacho includes a powerful diary management mode. 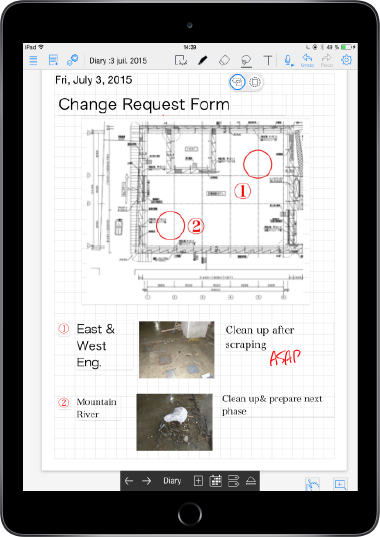 Pages in your notebook are timestamped at creation and can then be easily found via our innovative calendar layout. Including time and date information in a page automatically allows you concentrate on capturing information without worrying about how to organise each note. 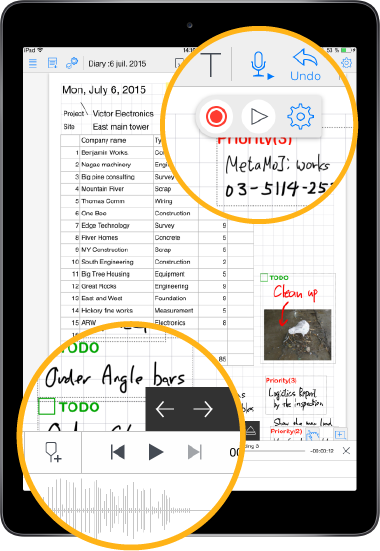 At any time you can see your note pages in date order, or use the calendar view to focus on pages created on a specific day. Work the way you want, for example using a different notebook for each project, functional area or customer. Each workbook can be time-stamped and organized to meet your requirements. Yacho allows you to add a reminder or alert to any content within your notebook. 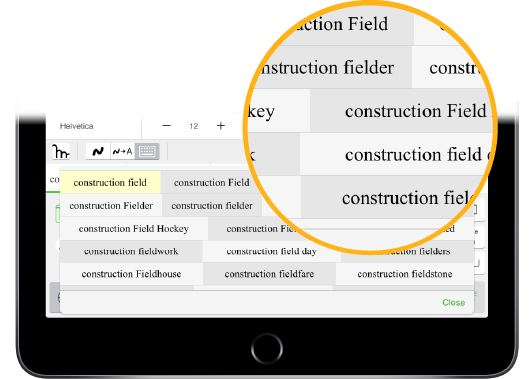 You can filter out each type of activity quickly and see a snapshot of the entire activity – not just a text description. 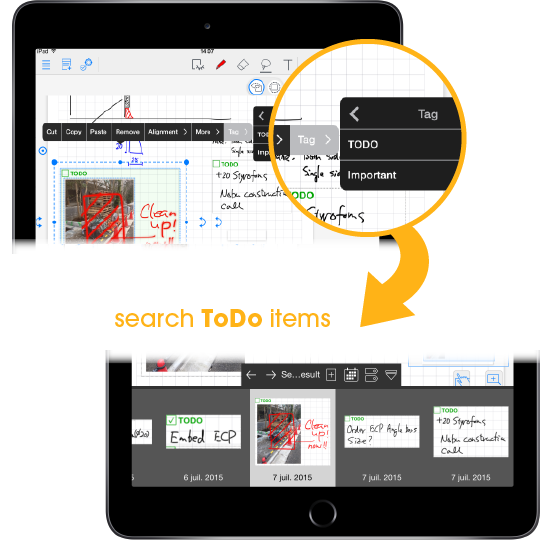 Quickly and easily mark up your information with actions by selecting the content (it can be anything including photographs, drawings, handwriting and any combination of these together) and then assigning a customizable action tag. These can then be searched, extracting the content from your note pages and displaying them in a concise manner. Easily capture audio and voice recordings in your notes. If recording voice notes is more convenient simply start the recording process with a quick tap. This feature also lets you record the sound of your site, from equipment noises to meetings or explanations from colleagues. Yacho was designed to help get more value while on-site and we recognize that not all information is visual. Use the built-in microphone of your tablet to record audio directly to your note page and playback at your convenience.